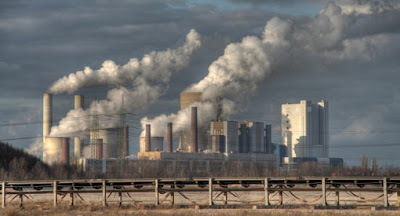 An entry about the costs of pollution in Paul Krugman's blog yesterday had the title "Markets can be very, very wrong". Indeed. A point we wanted to make in The Economics Anti-Textbook was that, for all the talk about Pigouvian taxes and tradeable permits in the microeconomics texts, the textbooks spend little or no time pointing out that governments often don't actually impose the taxes the textbook says they should to improve efficiency. Perhaps pointing out the obvious would raise 'controversial' questions (Why don't they use such taxes? Whose interests are served by allowing excessive pollution?). Controversy is something to be avoided in Textbookland, where the goal seems to be to maximize the share of the market and not annoy potential adopters of the textbook. They remark (p.1672) that "this does not necessarily imply that these industries should be shut down." [After all, where would ordinary folk take their yachts if there were no marinas?!] "On a formal level, it signifies that a one-unit increase in output of that industry has additional social costs that are higher than incremental revenues. At an intuitive level, it indicates that the regulated levels of emissions from the industry are too high."